A vet will often use X-rays to confirm an aneurysm after a general examination. Whenever your cat starts acting strange -- the bad "strange," not the cute Internet meme "strange" -- schedule a vet appointment. Aneurysms and their closely-related blood clots cause issues as slight as weakness or as glaring as bloody vomit or urine. Seek a diagnosis and treatment as soon as possible. The medical description of an aneurysm is simply "an abnormal widening or ballooning of a portion of an artery due to weakness in the wall of the blood vessel," according to the A.D.A.M. Medical Encyclopedia. It can cause a blood clot (technically, a thrombus), and even lead to death, depending on its location and severity. 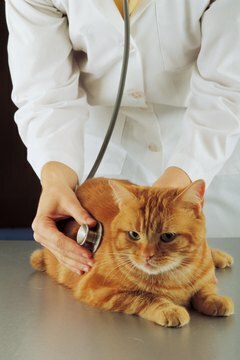 Common sites in cats include the main heart artery, the brain, their back two legs, the intestines and the spleen. It's hard to tell if your cat has an aneurysm at first, but, as it develops, it should become obvious something is wrong with him. In and of themselves, aneurysms cause few symptoms. Most signs are related to the subsequent thrombi, according to The Merck Manual for Pet Health. Watch your cat. If he suddenly has difficulty breathing, starts coughing up blood or bloody mucus, or has abdominal pain and bloody urine, an aneurysm and thrombus may be to blame. Later-stage problems run the gamut from infection to lameness. Schedule a vet visit at the first sign of trouble. The earlier it's diagnosed, the better. A side note of interest: In at least one incidence, first reported in "The Northern Virginia Daily" in 2011, a cat was apparently able to detect an aneurysm in his owner's brain before symptoms developed. It's unknown how or why this happened. Aneurysms can be congenital or related to other health issues. Heartworm disease is one culprit, although it's more common in dogs than cats, according to VetInfo. Cardiomyopathy, a heart muscle disorder, is another possible cause. A veterinarian can confirm the presence of an aneurysm with an X-ray, although she will probably run other tests on your cat to ferret out the underlying cause. Sometimes the aneurysm facilitates a thrombus that breaks off and is carried through the blood stream -- it's called an embolus, and it can cause blood clots elsewhere in your cat's body. Sometimes all three conditions are detected at once: an aneurysm, a thrombus and an embolus, according to The Merck Veterinary Manual. The best treatment for your cat's aneurysm depends on its cause and accompanying complications. At one end of the spectrum are anti-inflammatory drugs; at the other is the surgical removal of clots. Your cat's long-term prognosis depends on the severity of the underlying condition. Some cats fair well after treatment. Others die, sometimes quite suddenly. It's important to talk to your vet about all possible treatment scenarios, as well as their short-, medium- and long-term outlooks. Cats with neurological issues or weakness in their hind limbs don't always regain control of their limbs, even following successful treatment. Be patient with your feline friend when he starts any new treatment regime. Can Cockatiels See in the Dark?